Our ‘Everyday Adventure’ proposal was one of five shortlisted finalists for the Ebbsfleet Garden City: Landscape for Healthy Living International Design Ideas Competition, by Ebbsfleet Development Corporation, NHS England and the Landscape Institute. The brief was to find creative and inspiring ideas to help deliver health benefits and shape the landscape of Ebbsfleet in Kent; the first new Garden City of the 21st Century and the largest of ten Healthy New Towns in the UK. As humans, we often need encouragement to act in our own best interest & adopt healthy behaviours. At its heart, ‘Everyday Adventure’ therefore seeks to inspire active living and make physical activity the most convenient and preferred option for everyday journeys and experiences. ‘Everyday Adventure’ is based upon the concept that “Everyday life could be an adventure – where the normal school run, commute or daily routine provide a sense of joyful delight, community interaction and physical activity and an everyday outdoor adventure for the mind, body and spirit“. We worked with Chartered Physiopherapist Claire Powell of the Horder Centre, supported by advice from the Grow to Grow Team at The Commonwork Trust’s Bore Place, to explore the physiological and psychological issues that inform health and influence human response to the outdoors and exercise. We drew upon this information to develop a framework of convenient, active & sociable green routes and restorative spaces that connect people & place. A starting point for our design was to consider the journeys and activities that the existing and new populations might be making and how/whether these could be improved and integrated with Blue Lake to create better, more accessible routes but also to encourage a more active lifestyle. 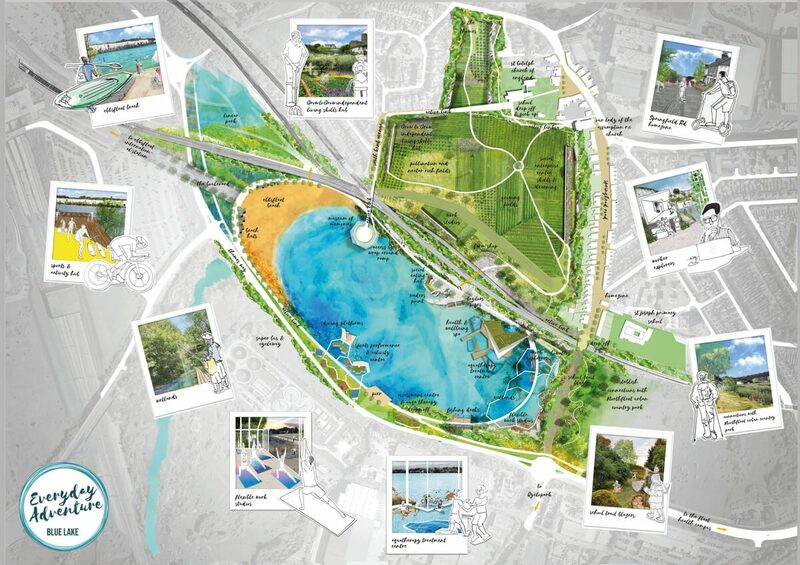 The scheme proposed a variety of recreation and therapeutic uses which seek to maximise the potential health benefits of the water and cliffscape for both new and existing communities. Features range from a beach area, a new museum providing both an architectural landmark and split level ramped access between the lake and existing cliff-top communities to the north, new fishing decks, an aqua-therapy treatment centre and health and wellbeing spa along with performance sports centre and physio/sports injury clinic, flexible work spaces that climb the chalk face up to a pedestrianised school route and extension to Northfleet Urban Country Park. Elsewhere on the site, a disused quarry was proposed as an exemplar organic community farm and social enterprise zone with the land use predominantly focused upon food growth and providing combined mental health and vocational support. Our proposal was described by the Landscape Institute as “an impressive multidisciplinary collaboration with a physiotherapist and Commonwork Trust to envisage the site as a ‘green prescription’ for preventative healthcare and everyday healthy living”.